Eli Friedlander has performed a valuable task by seeking to refute the popular notion that Benjamin’s oeuvre is too diffuse to allow for any unifying understanding of its nature and development. He asserts that it is possible to identify the ‘philosophical armature’ (1) that underpins Benjamin’s output and construct a dialectical synthesis that permits the contrasting critiques of friends such Gershom Scholem and Bertolt Brecht to be assimilated into ‘a unique configuration of philosophy.’ (1)This is a worthy scholarly exercise as Benjamin has too often been treated as a ‘pearl fisher’ (in Hannah Arendt’s words) who generated ‘brilliant and idiosyncratic insights with hardly more to unify them than the sense that they all bear the stamp of Benjamin’s unique and unclassifiable genius’ (1). Friedlander’s study is also welcome as it explicitly seeks to reclaim Benjamin as a genuine ‘philosopher ‘ in the Western tradition and not just an eccentric critic as some have characterised him. The author is interested in underlining the ‘systematicity’ (2) of Benjamin’s thinking. The book does not wholly succeed in this objective but comes closer than any previous attempt. The challenge facing Friedlander is an understandable one. Walter Benjamin occupies a unique position in the pantheon of great thinkers of the left .His life and thought intersect with a number of strands of radical theory that are usually regarded as unrelated –and sometimes explicitly hostile – to each other. Born and raised in a German rabbinical family at the end of the nineteenth century, at university Benjamin imbued the orthodox marxism of the powerful SPD, associated with theoreticians such as Kautsky and Bernstein. When the revolutionary storm broke in the aftermath of that conflict he was attracted to the revolutionary marxism of Rosa Luxemburg and the Sparticists. In the mid 1920s his engagement with marxism was reinforced by a reading of Lukacs’ History and Class Consciousness. A trip to Moscow a few years later triggered his disillusionment with the emerging Stalinist regime there. By the time of his death in 1940 he was associated with the thinkers of the Institute of Social Research in Frankfurt who would form the foundations of the tradition of Western Marxism. Throughout this sinuous intellectual development , he was producing a diverse range of texts on an equally diverse range of topics, including religion, literature ,technology and cinema. Most of this work would be unknown in the Anglophone world until translations appeared in the 1960s but from that point he became a seminal figure to the New Left and to emerging disciplines such as media studies and cultural theory. The fragmentary and diffuse nature of his output appealed to a generation that wanted to regain the emancipatory promise of marxism before it had become submerged in the morass of Stalinism. 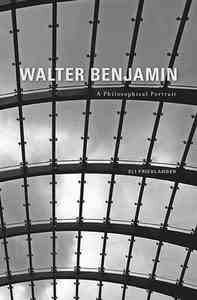 This biographical and political context is crucial to understanding Benjamin’s philosophical trajectory but one of the weaknesses of Friedlander’s study is that he virtually ignores it and adopts instead a purely thematic approach. The contest for ownership of Benjamin’s philosophical legacy had started in his own lifetime. The Kabbalist thinker, Gershom Scholem, had chided his friend for what he regarded as his infantile attachment to marxism and constantly encouraged him to emigrate to the nascent Zionist community in Palestine. In contrast, Bertolt Brecht was confounded by Benjamin’s unwillingness to let go of his life-long interest in Jewish mysticism and implored him to formalise his commitment to the official Communist Parties. Subsequent generations of leftists have perceived Benjamin as an attractive but ultimately frustrating figure who does not appear to slot neatly into any of the familiar categories of radical thought. Friedlander baldly states the challenge created by this heterogenous legacy: ‘Can one draw together this multiplicity and view it as the different traits contributing to a single physiognomy of thought?’ (1) The book answers in the affirmative and asserts that Benjamin’s climatic ‘Arcades Project’ supplies the solution to the enigma of his output. Friedlander argues this pioneering study of the Parisian arcades identifies the guiding thread for ‘constellating’ the disparate moments of Benjamin’s writing and facilitates the construction of a new appreciation. He writes: ‘The schematic scaffolding of the Arcades Project enables me to open up the panoramic unity or landscape of Benjamin’s writing as a whole’ (8). The consequence of this revision of Kant was that any attempt to stand outside language and devise a description of it was doomed to failure. The medium we use to analyse the world is entwined in the world and cannot be detached from it. Language – like all human communication – is saturated with ideology. Friedlander insightfully argues that this awareness on Benjamin’s part explains his methodology in the ‘Arcades Project’. That book is written as a montage of quotations, interspersed with aphorisms by Benjamin. This fragmented style, therefore, is not the result of the writer’s desultory attitude to theorising, as was argued by Theodor Adorno. Friedlander convincingly makes the case that Benjamin was trying to construct a new mode of writing suitable for a world in which perceived certainties of structure had crumbled. A new mode of capitalist consumption was being unveiled in Paris – one that would come to dominate our world – and previous modes of narrative were not equipped to explain it. The sensory bombardment that confronts the modern shopper as she walks past shop windows engenders an intensified alienation that even Marx could not have predicted. On the one hand, we are promised unprecedented gratification, but at the same time we are reminded of the facticity of social inequality. In Benjamin’s own words ‘the arcades-structures in which we relive, as in dream, the life of our parents and grandparents, as the embryo in the womb relives the lives of animals.’ (quoted on 260). Friedlander constructs a sophisticated and persuasive case that in the ‘Arcades’ form and content are sublimely matched. Analyses such as this illustrate the value of Friedlander’s study. However, it also points towards its key shortcoming. The book ironically represents a lost opportunity as notions such as ‘now-time, the awareness of the present as the possibilty of fundamental transformation’ (168), are not just interesting scholarly devices. Benjamin’s work is packed with insights such as this that can inform and mobilise political activism in our time. The idea of catastrophe as a component of the present, not only the future, is starkly relevant to contemporary debates about economic crisis and climate change. Friedlander is strangely reluctant to make these connections, even though he provides the foundations for them. Despite this underplaying of Benjamin’s ongoing relevance and a lack of contextualisation, the author deftly succeeds in defending the originality and coherence of his subject. Walter Benjamin remains a fascinating writer. An interesting review! Thank you! The reviewer’s complaint is that Eli Friedlander’s otherwise insightful book fails to speak to present-day political concerns. As a philosopher and scholar, Friedlander likely has no interest in doing this. The deeper question raised by this review is, then, what should the relationship between past-oriented scholarship and present/future-oriented politics be? A very Benjaminian question indeed. I’m reminded of a line by Martin Jay: “[I]f the study of intellectual history is to have any ultimate justification, it is its capacity to rescue the legacy of the past in order to allow us to realize the potential of the future.” One might conclude from this remark that there’s a sort of division of labor between the author/scholar and the reader: the scholar “rescues the legacy of past” in order for us, the readers, to “realize the potential of the future.” So perhaps we shouldn’t fault Friedlander too much for not making the political connections that the reviewer wants him to. That’s our job.